Graig Abel has been the official photographer of the Toronto Maple Leafs for more than 35 years. With his vast wealth of material, Abel has put together a book detailing the history of one of hockey’s most famous arenas. 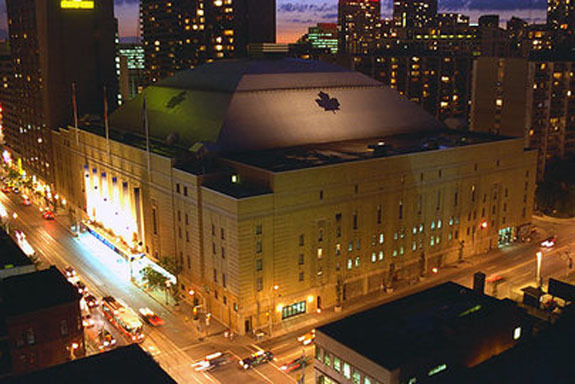 Up until its closing in 1999, Maple Leaf Gardens has not only showcased the NHL franchise Toronto Maple Leafs but also premiere sporting events, memorable concerts and even famous wrestling and boxing cards. Abel hand picked his favorite photos creating a celebration of Toronto’s premiere entertainment venue. **I received a free copy from the publisher in exchange for a fair review. Author Graig Abel took this iconic photo of Maple Leaf Gardens before the start of that final season in 1998. A lot of people have tried to recreate it over the years but he can always spot his by pointing out two “ladies of the night” featured prominently in front of the arena. He’s deathly afraid of heights so in order to get the best shot, he needed to get onto the roof of an adjacent building and imbibe some liquid courage to get as close to the edge as possible. That’s just a taste of some of the things you’ll learn in this book. One such story involves Abel taking player headshots for the upcoming season and during one such session, sharing cigarettes with two NHL players who were trying to make the team. Can you imagine if the coach spotted you lighting a dart nowadays? You’d be off the team in a second! In fact, his favorite player to shoot was Chris Kotsopoulos who would often light his cigarettes with the team blow-torch used to curve sticks. 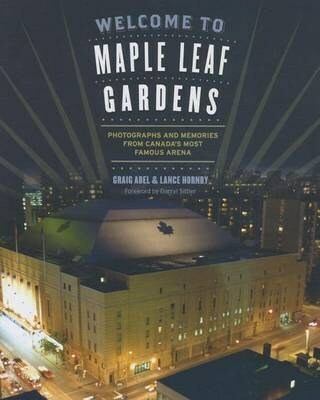 The book has shots of every aspect of the Maple Leafs team during their tenure in that building. In addition to action shots and team photos, you’ll get candid shots of equipment managers, locker rooms and the team gym. In addition to a wealth of on ice photos, Hornby also throws in a few concert shots as well as a few WWF (now WWE) wrestling cards. It made me long for an experience inside those hallowed halls. When I finally arrived in Toronto, I was two years too late and the Gardens had already closed up shop. It’s nice to know that it’s been reopened and sectioned off into a multitude of outlets including a grocery story and athletic centre. Maybe it’s not too late after all to get back inside. Oh, and this was by far my favorite shot of the bunch. 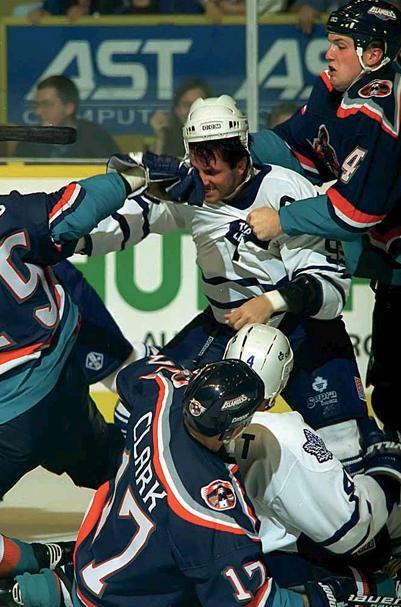 My all time favorite player Doug Gilmour seemingly taking on the entire New York Islanders. Hey Dougie! What’s your secret? November 8, 2013 in Graig Abel, lance hornby, Non-Fiction.